The Deseret News is the first news organization and the longest continuously-operating business in the state of Utah. Owned by the Church of Jesus Christ of Latter-day Saints, the Deseret News offers news, information, commentary and analysis from an award-winning and experienced team of reporters, editors, columnists and bloggers. Its mission is to be a leading news brand for faith- and family-oriented audiences in Utah and around the world. The Deseret News has a unique, targeted audience throughout the state and a strong national and international following. Advertisers reach an exclusive audience that is not available anywhere else. The Salt Lake Tribune has been Utah's independent news source since 1871. It is the largest-circulated daily newspaper and online resource covering breaking news, entertainment, sports and weather for Salt Lake City and the state of Utah. Advertisers turn to The Salt Lake Tribune to reach an informed, affluent and consumer-driven audience. Money Bags is a customer-targeted program that extends its reach to more than 50,000 households. Money Bags is delivered by hand to the fastest growing and most affluent areas in Salt Lake, Davis, Utah, Tooele and Weber counties. Search marketing experts seemed puzzled by President Donald Trump's attack of Google in Twitter tweets that accused the company of prioritizing liberal "fake news" in its search results. "Google search results for "Trump News" shows only the viewing/reporting of Fake New Media. In other words, they have it RIGGED, for me & others, so that almost all stories & news is BAD. Fake CNN is prominent. Republican/Conservative & Fair Media is shut out. Illegal? 96% of..," Trump tweeted on Twitter. The allegation may have originated from headlines and news articles like "96 Percent of Google Search Results for 'Trump' News Are From Liberal Media Outlets." And while that may be true when it comes to ranking high in query results based on the keyword "Trump," search experts know better whether or not someone believes in the president's policies. Jonathan Kagan, senior director of search at Cogniscient Media, a Marc USA company, called the claim baseless. "Trump made a similar claim during the election saying the autofill wouldn't fill in for 'crooked Hillary,' but would fill in for some derogatory statements about him," Kagan said. Google designed the autofill in the search box to filter our certain words. Words like "crooked," for example, he said. 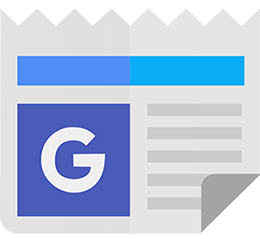 "When users type queries into the Google Search bar, our goal is to make sure they receive the most relevant answers in a matter of seconds," wrote a Google spokesperson in an email to Search Marketing Daily. "Search is not used to set a political agenda and we don't bias our results toward any political ideology." Each year, Google releases hundreds of improvements to its search algorithms to ensure they surface high-quality content in response to users' queries. "We never rank search results to manipulate political sentiment," the Google spokesperson wrote. Optimizing content to appear high on the page in search continues to become a valuable skill, as marketers know. Google only gives hints as to some of the triggers required for a publisher's content to rank high in the results on page one. Part of the query ranking of a keyword for news in search results relies on personalizing the results based on past browsing and searching history. This means the algorithms running search skew toward the historic searches and clicks. The ranking of a publisher's site in search results also relies on the quality of the website, which helps to confirm legitimate news. Another key trigger relies on whether or not the site runs on HTTPS, a protocol called hypertext transfer protocol secure in which the "s" plays a key part to secure content and filter out hackers. Earlier this year, Google hinted at a small ranking boost for sites making the transition from HTTP to HTTPS. In February 2018, Google said it would start labeling sites and webpages still using HTTP as "not secure" by summer 2018. For instance, foxnews.com is marked "not secure" because its website still runs on HTTP, not HTTPS. On first glance, it appears that sites like Fox News are de-emphasized in search results, but the reason centers on lousy SEO on the part of the publisher, said Marty Weintraub, founder of aimClear, a marketing agency. "Before anyone can complain about being pushed down in rankings, they need to fix their website," he said. Testing the theory in google.com, Weintraub used a new desktop browser window and new IP address clear of cookies, so Google's algorithms couldn't use his past search history to return query results. 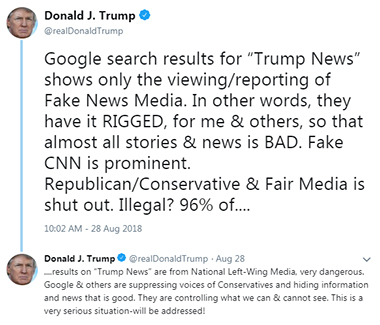 "Fox News doesn't acknowledge Trump in the headline of their articles, and that could have a whole lot to do with where its articles rank in Google search results based on using the keyword 'Trump,'" he said. Headlines from CNN, The New York Times, NPR, The New Yorker, ABC News and others ranked much higher on the page. In early 2016, Mother Jones launched a fundraising initiative called "The Moment for Mother Jones." The fund aspired to raise $25 million for "expanded reporting, greater impact and reach, enhanced professional development opportunities for young journalists, new investments in technology and tools, deeper engagement with our audiences, and exploration of promising business-side opportunities." The business side of news reporting – and the investment in investigative reporting – was already in a dismal state. Some organizations like Mother Jones and others were looking to the future and new models that would help them survive. Since launching its "Moment," Mother Jones reports it has raised almost $20 million toward its goal. Its newsroom is the biggest its ever been, with support from both readers and the fund. Yesterday, Craig Newmark, Craigslist founder and head of Craig Newmark Philanthropies, gifted the publisher an additional $1 million. The gift comes with no guidelines about how it should be used. In a piece posted at Mother Jones, Newmark stated: "We're in the middle of an online information war, and the stakes are a free press, an informed public and strong democratic institutions. "Mother Jones is at the center of that fight, defending the country against bad actors. As a news consumer and citizen, I depend on its innovative, rigorously accurate reporting, and I'm thrilled to support its growth." Mother Jones plans to use the new ifunds to improve its investigative reporting, data journalism and covering disinformation, while also investing in audience engagement. According to Mother Jones CEO Monika Bauerlein, the publication's audience has asked it for guidance in spotting misinformation and interpreting news as a journalist would. Newmark has also made donations to nonprofit heavy hitters like ProPublica, which has done its part in funding investigative projects in local newsrooms across the country, as well as the Columbia Journalism Review and Columbia's Tow Center and the Center for Public Integrity, among others, creating a cyclical stream of money between outfits aiding pursuing quality journalism and those publishing it. Newsroom staffs are shrinking to anemic levels across the country – just last week McClatchy announced it would be laying off 3.5% of its workforce – and advertising dollars show no signs of being replenished. Newsrooms suffer doubly at a time when journalism is more important than ever. Case in point, Ronan Farrow's investigative pieces on Harvey Weinstein and David Pecker for The New Yorker have forever changed the cultural landscape. But civic responsibility and enterprise journalism cannot be left solely to funded outlets like The New Yorker. To create a truly sustainable future for journalism, the public has to see the value and need for well-funded newsrooms, in addition to specific philanthropic efforts. Interviewed by the Poynter Institute, Mother Jones publisher Steve Katz commented on the real need for donors in today's journalism world. Relaying his experience to donors and how they react, he stated, "[They understand] you're asking me to think about journalism as a public good, like the university I went to or the hospital in our town. It changes the way of thinking not just for Mother Jones, but journalism for general." The period of times a user is actively engaged with the website, app, etc. during a selected date range. All usage data is associated with a session. Someone who has had at least one session within the selected date range. This includes both new and returning users. Total number of pages a user views during a session. Repeated views of a single page are included. Organic Search – Users who come to your website by using a search engine such as Google. Direct – Users who come to your website without a clear referral source, such as using a bookmark or typing in a URL. Referral – Users who come to your site from another website by clicking a link. Social – Users who come to your website from a social network such as Facebook, Instagram, LinkedIn, etc. Paid Search – Users who come to your website from AdWords or another paid search ad. Users are assigned a User ID the first time they access a website using a device. The user may also have used another device to access content.